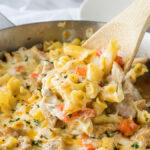 This Creamy Cajun Chicken Pasta Skillet is filled with cajun spices, tender chicken and pasta and is all ready in less than 30 minutes! Season the diced chicken thighs with salt, pepper and 1 tbsp of the cajun seasoning. Heat oil in a large skillet over medium high heat and cook chicken until browned on all sides, stirring occasionally. Add the bell pepper, onion and garlic to the skillet. Cook another couple minutes until the onions and pepper are tender. Add the chicken broth and uncooked noodles to the skillet, stir to combine. Bring to a gentle boil, then reduce heat to a simmer. Cover and cook for 10 to 15 minutes or until pasta is tender, stirring occasionally. Stir in the heavy cream and remaining cajun seasoning until combined. Top with the shredded monterey jack cheese and broil about 5 inches away from the heating element in your oven for about 2 to 3 minutes, or until cheese is slightly browned and bubbly. Carefully remove from oven, let cool slightly, garnish with parsley if desired and enjoy!